Structure freaks so many writers out … It can be enough to strike fear into the heart of ANY spec screenwriter or unpublished novelist. But I actually think getting to grips with this is THE KEY to not only being a ‘good’ writer, but a SUCCESSFUL one! Whilst some structure methods like Blake Snyder’s ‘Save The Cat’ may seem formulaic, it’s important to note structure is NOT a formula. (Also, don’t forget Snyder never meant ‘Save The Cat’ to become the checklist it has, especially in some Hollywood circles). Stories are simply this: BEGINNING – MIDDLE – END. We all know this. As children, we listened to fairytales that were prefaced with ‘Once Upon A Time’ and ended with ‘Happily Ever After’. In the middle, there was conflict between children and wicked witches; or curses and beautiful princesses; or wolves and lost girls. 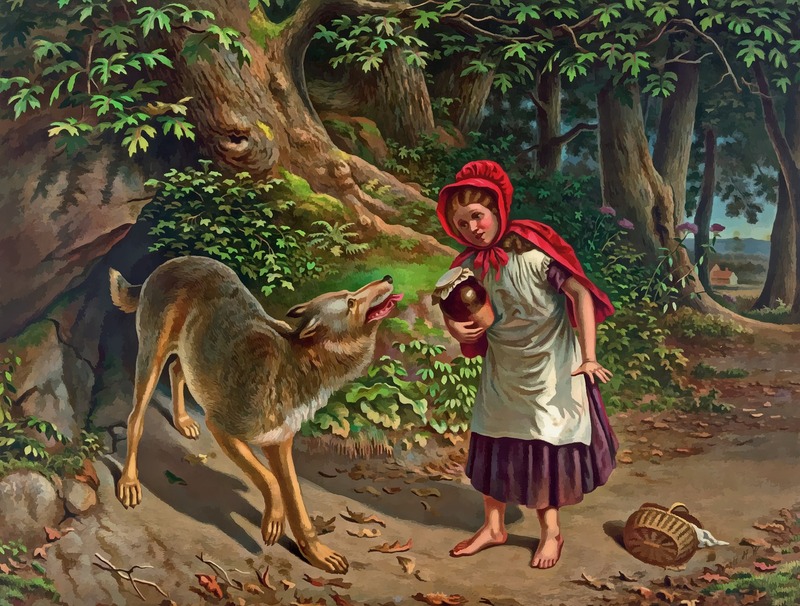 Whether we love or loathe them, fairytales stay with us all because they are the epitome of storytelling, a melding of characterisation and structure. This structural representation can be applied to ANY given medium or story; it doesn’t matter whether you’re writing a novel or screenplay (or something else! ); nor does it matter what genre or technique you’re using (drama screenplay or literary fiction included); or whether you’re doing a two, ten, thirty, sixty, ninety or one hundred and twenty page screenplay. Most crucially however, it also illustrates how character motivation and structure are inextricably linked. No one watches or reads a story about *a character* … We want to be INVOLVED in a story about ‘a character who does STUFF (for some reason)’. This is paramount, yet is constantly underestimated, even by supposed ‘gurus’ who wax lyrical about characterisation being the most important thing EVAH. This is romantic BS. Structure and character are equally important. Nothing more, nothing less. ROUND UP: Structure and character go together, but we shouldn’t be a slave to page counting. Structure is a framework, NOT a formula. I think what is most interesting about the paradigm is its notion of Dramatic Context. Whilst I had – like most writers – an innate understanding of story structure as ‘BEGINNING – MIDDLE – END’, I had not grasped the importance of dramatic context (and thus PROGRESSION or ESCALATION) in any given narrative. So, whilst protagonists DON’T always have to change in a screenplay or novel, the Dramatic Context absolutely does … Otherwise there is quiteliterally NO POINT to the story. We’re back to this notion of simply watching or reading about ‘a character’ … when we should be watching or reading about ‘a character who DOES STUFF (for some reason)‘! ROUND UP: The PROGRESSION of your story is frequently about Dramatic Context … Characters should go on A JOURNEY. 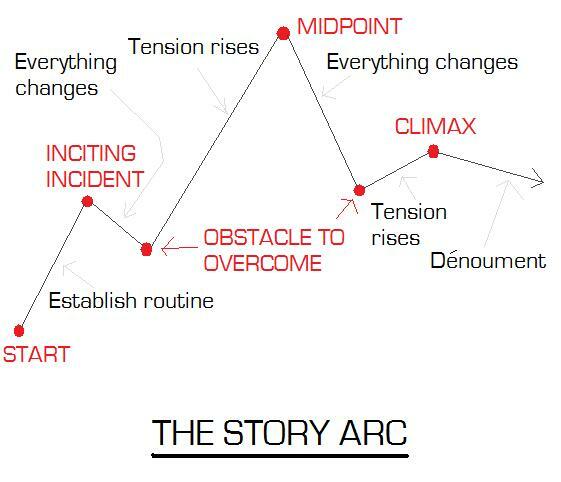 I don’t know who exactly came up with this visual representation of storytelling structure (Google doesn’t come up with much, plus various writers, bloggers and educators have done various versions). Again, the process here is more or less linear, or BEGINNING – MIDDLE – END. However, it disguises this aspect with its ‘spiky’ appearance that appeals to writers with a more laissez-faire attitude to structure and plotting (ie. those who reject academia,or writing advice generally, as is so often the case with the plethora of blogs, screenwriting books, etc). In addition, this visual representation makes no reference to fancy-schmancy terms like plot points, dramatic context and acts, etc. As a result, writers who previously felt structure was about ‘formula’ can often appreciate the need for a FRAMEWORK for their stories, which will in turn help them with PLOTTING. ROUND UP: Writers don’t need to get academic to appreciate the need for structure and moving from A to B to C in their plotting. I found the Plot Line Graph only recently and again, I don’t know who came up with it. But I had a particular Bang2writer I was working with who rejected the three representations I’ve outlined already. The writer in question felt the others were not truly representative of their vision of how storytelling works, either because they were ‘TOO linear’ or conversely ‘TOO spiky’! As you can no doubt see, The Plot Line Graph is basically an amalgmation of both the more linear and free form methods already mentioned in this post. 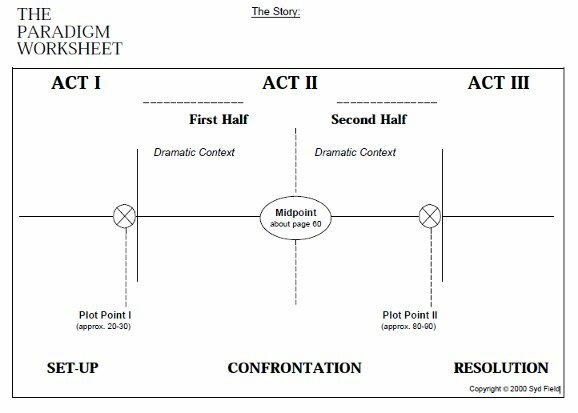 This graphic also applies timings which can be particularly useful to those screenwriters ready to graduate from more prescriptive methods like ‘Save The Cat’ BUT who feel daunted by the notion of that ‘structure as framework’ I have outlined in previous sections. Novelists can also apply this method by working out how many pages their novel has and working how many they need equivalent to 30, 60,90 etc. 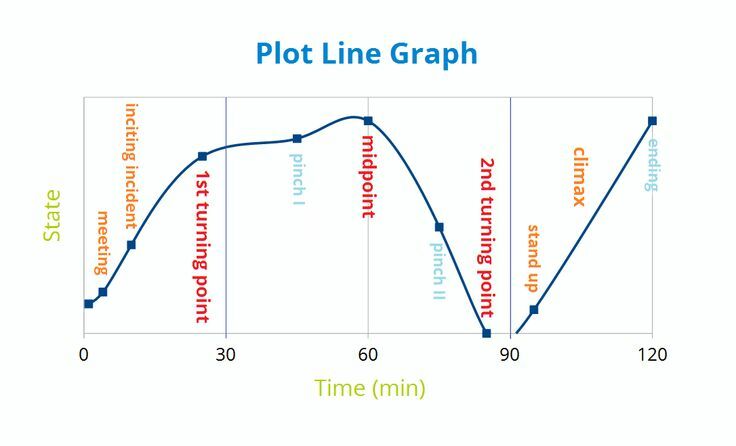 ROUND UP: If you worry in particular about Act 2 in your script or novel, then this graphic may help ‘anchor’ you and keep you on track with regards to your plotting. However, like the Bang2writer with reference to graphic 3 on this list, sometimes seeing storytelling structure IN ACTION is the ‘best’ way for us to really appreciate how it works. 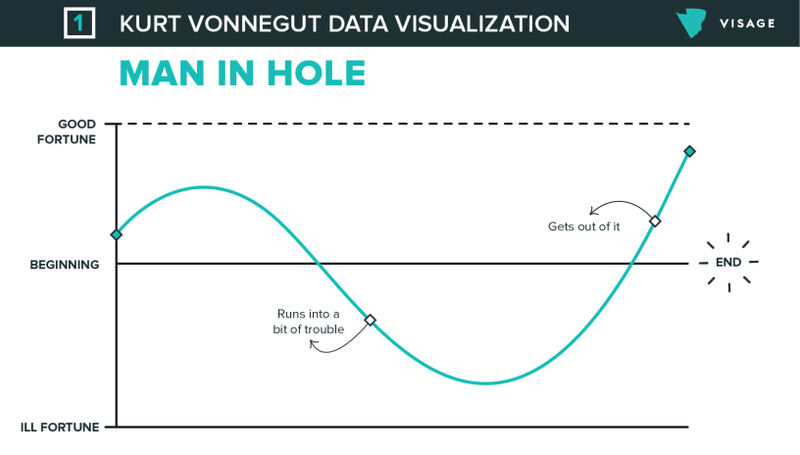 What I love about ‘Man In Hole’ is it can be seen as LITERAL or METAPHORICAL … and as a result, can be applied to just about any story if we want it to. What’s more, the notion of Dramatic Context (or rather ‘escalation’ or ‘progression’) is clear, as is the idea of character motivation – after all, if you’re in a hole (real, or imagined, or both), then you have to GET OUT – that’s your mission. It’s obvious, really. BOOOOM! BUT whilst BEGINNING – MIDDLE – END is very clear in ‘Man In Hole’, sometimes we want to write stories that aren’t quite as *obvious*, especially if we’re writing drama or literary fiction, that may seem to be more ‘episodic’ in nature. by mayaeilam, published on Visually. ROUND UP: No matter what we’re writing, there is a ‘shape’ to our story. Appreciating what that shape is will help us with our plot construction and help us ensure our character goes on a journey via BEGINNING – MIDDLE – END. Successful writers invest in structure, as well as characterisation. They may do this overtly, or covertly. Also, with so much writing on structure available, we’ll ‘fall in’ with what makes MOST SENSE to us … You’ll note I don’t mention stuff like sequence methods, or The Five Act Structure. This is because, as far as I’m concerned, these two versions are simply derived from The Three Acts, just described differently. However others won’t agree and that’s fine too. The luckiest amongst us have an innate understanding of how plotting comes together, but it’s wiser NOT to leave this to chance. Your competition is huge. What’s more, if you have the tools and the vocabularly to DESCRIBE how structure works, you will be able to write quicker drafts and fix them quicker too, enabling you to work with others – agents, producers, publishers, your peers – more effectively. Lastly, structure is NOT formula, it’s a framework. Whilst it’s true certain methods may seem more ‘prescriptive’ than others, as long as we reject page-counting and other contrived methods of structure, than we CAN do what is best for our stories. IN SHORT: Working out exactly how you see structure working can ONLY help you. No one cares how you ‘do’ structure … Just as long as you do it! So, what are you waiting for? Thanks for the informative article, Lucy! I like #3, The Story Arc, the best. Right now, I’m using the Save the Cat method for structure, it’s helping me stay on track and frees me up to be creative. But, as I become a better writer and more experienced, I’ll try different methods too. But, like you said, no matter what method we use to structure our story, it still comes back to the 3-act structure of storytelling. I found this fantastic page by a very circuitous route, but I’m so glad i did! 😀 I will be re-reading this many times and taking notes. And I’ve already sent in my request to join the fb group. 😉 Thank you ~so~ much, Lucy for this resource! I will be visiting this site ~often~! Cheers! Great as ever Lucy. Looking forward to seeing you onstage at the London Screenwriters Festival. Excellent! I appreciate your work, cheers! Np problem. Good luck with your writing!